UNU-WIDER : Blog : Poverty and inequality – twins or just siblings? Poverty and inequality – twins or just siblings? Sitting in the large conference room where we are being invited to ‘Think WIDER’ at the WIDER Development Conference this September. Surrounded by, and listening to, the great minds that do analyses and research on development topics from all over the world. I could, therefore, not escape feeling challenged to think w i d e r on poverty and inequality. Used to see these two key issues of development discussed together, one may find them as twins, two phenomena with the same nature. But are they? During the great panel on the topic I came to feel that, more than twins, they are siblings. And although there´s no proper way to age them as social phenomena, I would argue that inequality is the younger sibling. Together, the two siblings appeared, for a long time, to be left more to fend for themselves, because ‘parents’ did not have time to play with them. Maybe, now, inequality is capturing a bit more of the attention of the ‘adults in the room’ than poverty, but, surely, the debate on inequality may learn a lesson or two from the ‘older sibling’. One could easily argue that when inaugurating the science of economics with his ‘Wealth of Nations’ Adam Smith was also thinking about the opposite of wealth, poverty. That would place the issue of poverty in the very beginnings of the discipline itself. On an equal token, issues of fairness or redistribution are taught in Economics 101 as the ‘other problem in optimal scarce resources attribution’, the first one – all too often, the only one concerning advices on economic policy – being efficiency. It is telling that poverty reduction only became part of the policy dialogue in the 1970’s and inequality reduction only became inscribed in the global policy consensus through the 2015’s Sustainable Development Goals. Theoretically, poverty can be improved by benefiting some, with no evident cost to others – there are evident win-win solutions. Inequality of outcome (for example income inequality) is exactly the opposite. Action on inequality is always dichotomous – in the short-run the balance cannot change without some winning (at least relatively) and others loosing (at least relatively). The challenge here would be to more clearly communicate the long-run effects of increasing or, conversely, reducing inequality. Most enlightening was the evidence provided by the IMF session in this conference suggesting that, from the current levels, reducing inequality can actually induce increased growth in the long run. Therefore, in the long-run, arguably, all will benefit from a reduced inequality. Poverty is a clear, additively decomposable measure, i.e. it can be broken down into partial measures, adding or averaging into overall poverty. This allows to pin-point explicitly clear policies: increase access to health, increase access to education, introduce (conditional or unconditional) cash-transfers, to name a few. The effects of policies can be argued in a linear way, which facilitates the dialogue with policy makers. Inequality measures, however, are non-linear by construction – it becomes less apparent how a policy measure y will induce an x amount of inequality reduction, because, among other things, it also depends on the initial level of inequality. This is because, depending on the initial level of inequality, measure y may be more or less effective in reducing it. This makes it more difficult, for instance, to argue that a particularly effective measure put in place in one country would work in another country with different history and context. 3. How do we know we have met our goals? Poverty has clear yardsticks – it is evident and consensual that zero-poverty is the goal; it is therefore evident and consensual that all poverty is excessive. Inequality does not have such yardsticks. Martin Ravallion said it clearly: zero inequality of outcomes is not the goal. However, do we know what is the socially dynamic optimum minimum inequality? Do we know what is the threshold of excessive inequality, above which action becomes imperative? I would argue we still do not have answers to these questions. The lack of evident thresholds blurs the debate on policy: it is relatively easy to state we need to curb excessive inequality; it is more difficult to enact policies if there is no agreement on when inequality becomes excessive or stops being so. Strong strides have been achieved in reducing poverty – what can we learn for the fight against inequality? Both poverty and inequality are indirect societal effects of economic and political processes. In the case of poverty, as Martin Ravallion so clearly indicated, it results from changes in economy wide resources (be them income, earnings or accessible education or health services, among others) and changes in their distribution – most importantly, these are changes in inequality as well. 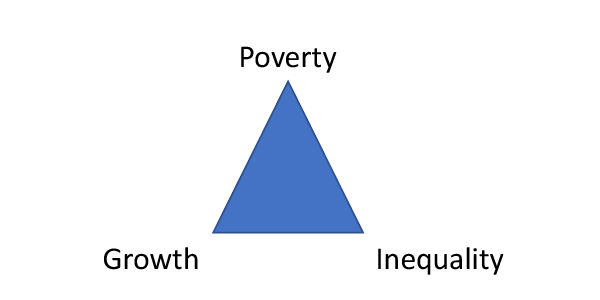 Therefore, action on inequality can be highly complementary to action against poverty, while the learnings on the need to identify channels for poverty eradication highlight the critical need to seek what are effective channels for inequality reduction. I would also highlight the rich source of learnings that can be brought from the ever evolving and improving contribution of OPHI’s research on measuring and communicating multi-dimensional poverty, of which we were offered a jewel of a presentation by James Foster. Inequality is of course also multidimensional. In particular, I noticed the coincidence of the emergence of dashboards, advocated by Paola Ballon and Francois Bourgignon as means for communicating the evolution of multiple dimensions of poverty and inequality, respectively. I would finally notice that there is a need for Economics to also engage more intently and consciously with Political Science on the analysis of inequality. Being dichotomous, inequality is not only about income or only about access. It is also about the power to maintain, reinforce or counter-act an unequal status-quo. Conservative political platforms have been recently successful, for example, in the United States, the United Kingdom (Brexit) and Hungary. Furthermore, far right political views have been strengthening in France, the Netherlands and Sweden, just to name some. This may lead us to consider whether policies or socio-economic phenomena that can potentially lead to reduction of group-inequality may, exactly because of such reduction, generate a political backlash originated from the better-off groups. For close to a century, poverty, and especially inequality, were the abandoned children of mainstream economics. They are, arguably, still conquering their space. In this process, poverty came earlier to the centre of Development Economics and Development Studies. With the Sustainable Development Goals, inequality is, arguably, no longer a footnote in the study of economic phenomena. It can be felt to be the ‘new kid on the block’, the one that attracts the attentions. But by no means should the spotlight be taken away from poverty. Poverty and inequality are complementary aspects of human development. For their differences, they may need, on occasion, specific spaces for research, debate and reflection. For their complementarity, they need to constantly be in dialogue. What would it take for Mozambique’s growth to be inclusive? Poverty and inequality - what's next?